My first one! it's basic, but what do you think? agreed.. nice job. but kyo looks so sad!!! he should be fighting, feisty, and happy. :( . yeah, after looking back, i probably should have made some final touch-ups before posting. i'll keep that in mind in the future! 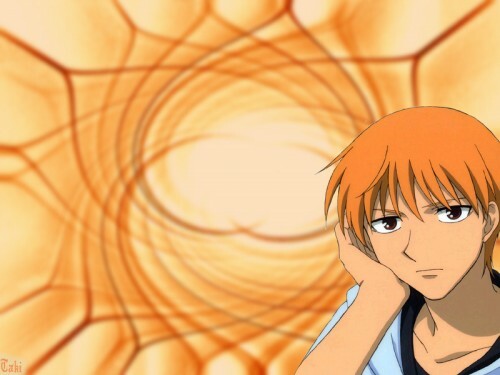 My favorite character in Fruits Basket ^_^ I like it. Its Kyou and he looks soo hot in that picture and I totally love that background!! Great work!! I love the background, so phscyhodelic...or however you spell it...lol anyways it's a cute pic, simple but colorful thanks!